Scroll down and click on your size shirt from the pull down menu below. 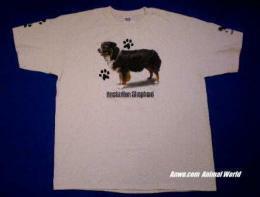 Australian Shepherd T Shirt Adult and Child Sizes at Animal World® looks Australian Shepherd lover awesome. Featuring a large front Australian Shepherd print, paw prints on one sleeve and the same Australian Shepherd Dog artwork in reduced size on the other sleeve this Australian Cattle Dog adult T shirt is printed on natural color 100% cotton in Adult Sizes S, M, L, XL, XXL, XXXL and Child sizes S, M, L. Shop our Australian Shepherd Gifts Store at Animal World® page for additional Australian Shepherd gift items. Shop our Dog Breed T Shirts Store at Animal World® page for additional Dog Breed T Shirts. To buy the Australian Shepherd T Shirt simply click on "Order" above.